Worship is held Wednesday mornings at the school so we got to go. They pray, sing, clap, and sing Hallelujah! After they were done we stood in the front of the class and sang ‘I Am a Child of God'. Not nearly as exciting, but they liked it. To spice it up, we also sang “Popcorn Popping on an Apricot Tree”…with hand motions! Our class went ok. We taught about the scientific method and how it applied to a little volcano experiment we showed. The teaching did not go over very well and we had to simplify it a LOT. But the Playdough building around the medicine cups we used was a hit! All the kids wanted to touch the dough so I broke off little pieces and let everyone help put it on the cup. We put baking soda in the cups and then added vinegar to make it fizz over like lava. As they were gathered around I tried to explain in very very basic terms how volcanoes are like mountains with holes in the top. Steam comes out because of the very hot rock inside. It bubbles all day until it finally explodes out of the volcano. Sometimes this only happens once every 50 - 100 years or more. Looked like they understood but it is amazing what they do NOT know. Not their fault, it just isn’t taught to them, or they haven’t been challenged enough in their critical thinking skills to really think hard about new things, etc. At the end of our teaching we graded some assignments outside as the teacher took over the class. It was raining, of course, and very calm. Some of the little kids on break were playing in the puddles. Cute. 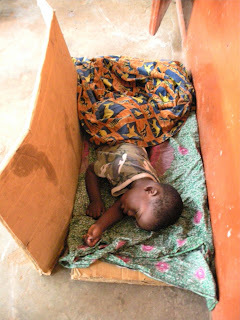 And one little boy was sleeping outside his mothers classroom as she taught. So, I’m discovering that if we ever encounter a problem with our room or how something is working the hostel workers tell us it is because of the rain. Sometimes this makes sense, like the rolling blackouts (as we experienced in the middle of dinner tonight), the bullfrogs that have taken up residence in the puddles outside our window, and the internet shorting out, but other things like our toilet not working??? Um…what? Now it’s just a joke between us. This weekend we are going on our first excursion to the rainforest and a nice beach. I am so excited! We have been working hard and getting used to this whole new world, so a break just to play will be nice. I have become the group beautician apparently, so I am often styling hair for the girls. We try to make the best out of what we have for beauty supplies. As I’m typing, Jordyn just asked if I wanted to French braid her hair. Haha! I saw this little girl playing in the rain today as we were waiting to leave the school. She finally saw me and waved. They always wave. So polite and happy. My days are feeling more organized and I'm learning better what to expect. The rain has washed away the constant smell of roasting pine nuts and pot to leave a nice hot Smokey wet smell. Ty would love the overcast weather. Sure beats the stifling heat. We're off again to finish up our AIDS training so hopefully all goes well. Here is the photo of my bleeding leg when I finally arrived at the orphanage. Nice! I never read your posts just once. I feel for your tummy Anne Marie!